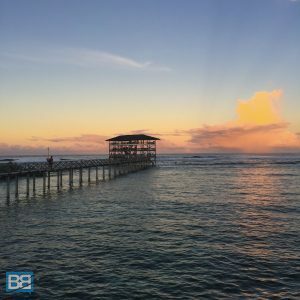 Siargao Island in The Philippines is somewhere I have fallen madly in love with and after returning to it for a second time I enjoyed a month surfing a relaxing there – which did nothing more than make me even more obsessed with it! Sure Siargao is famed as a surf destination (the main reason I was there to be honest!) but even if that doesn’t interest you the stunning beauty of this quiet little island is reason enough to pencil it into your travel plans for South East Asia! 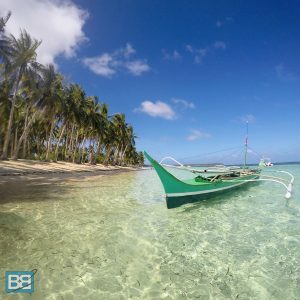 Blue skies, palm trees and quaint local fishing boats – Siargao really does serve up some postcard perfect photo opportunities! If you’re heading there to surf you can easily barter with the fishermen and jump on board to some of the many local reef breaks. The most famous surf spot on Siargao – and indeed The Philippines – is Cloud 9. A fast, hollow reef break which serves up some awesome barrelling sections. Even if you don’t surf or it’s too heavy for you, grab a beer, stroll along the boardwalk, and watch it from the lookout tower. It’s a great place for sunset too! 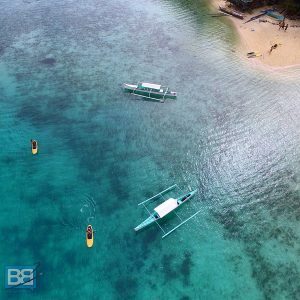 Dacu Reef – a quick boat ride from Siargao – is one of my favourite surf spots on the planet. It’s a reef break, but deep enough that beginners can join in the fun if the swell isn’t too big and if you’re staying at a surf camp on Siargao you’ll probably hit this spot up. If you’re a long boarder you’ll love this spot, just dive overboard, paddle out to the peak and enjoy! 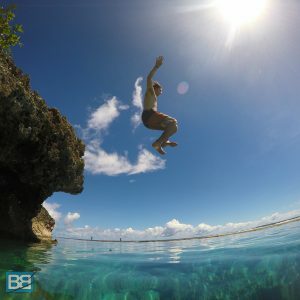 Magpupungko Rock pools is one the of the awesome places of interest that you should try and visit during your stay on Siargao. This huge natural rock pool is perfect for a bit of snorkelling and there is a rock jump off in the middle too. Just make sure you time your trip for low tide…! The bottom half of Siargao around the General Luna area is a natural lagoon and even at high tide it’s pretty shallow and calm. This makes it the ideal spot to float around in the warm, clear waters, kayak or try your hand at SUP. Or grab your GoPro and snap some pics of your own slice of paradise! Another spot to check out during your time on Siargao are the lagoons on the West Coast of the Island. You can organise this through most of the hostels and surf camps out there – a great spot to spend a lazy day with fresh BBQ lunch and a few beers! …and if you’re lucky some of these little guys will join your lagoon tour too! 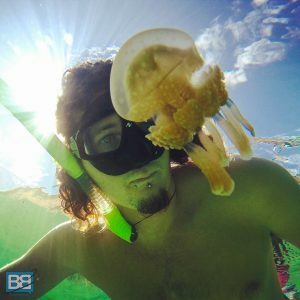 Although this isn’t the famous Filipino “Jellyfish Lake” there are usually a few of these stingless jellyfish kicking around! Another great thing about Siargao is the fact it’s still not a budget breaker and there’s plenty of accommodation options for all styles and comfort levels. 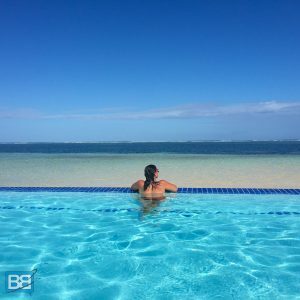 If you want to splash out you can have a pool overlooking the ocean for about £25 per night…or if you’re staying somewhere cheaper you can simply pay to use it for the day! Everytime I walked to the beach through the palm tree forest I couldn’t help but pinch myself! I’ve travelled to beaches and island all over the world and none have had the same impact Siargao has had on me. I barely saw anyone on the beach at all…and somewhere like the Maldives you’d be paying heaps more for a view like that! 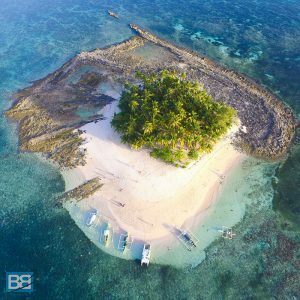 And of course you can always visit some of the surrounding islands off the south of Siargao too on an island hopping day trip. This is Guyam Island where most of the trips spend sunset…not a bad place to chill out hey?! 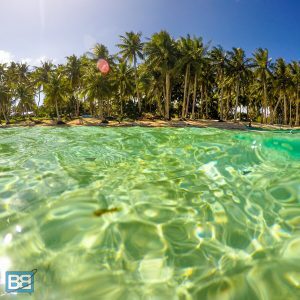 What do you think – tempted to visit Siargao now?! 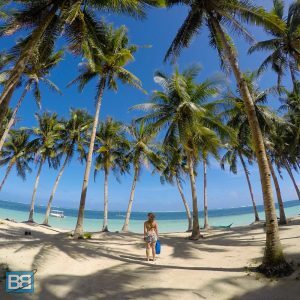 If you are check out my Ultimate Guide To Siargao – including places to eat, surf, sleep and how to get there! We are really hoping to get back to the Philippines this year, Siargao is def on my list! Hey Chris, love your posts! Is it possible to kitesurf at Siargao? How’s the wind like in march? Thanks! Hey Fong, indeed there are a few kite surfing schools in the General Luna area now. Not too sure on the wind side of things…sorry! Its a pretty epic spot to cool off hey? It’s at a resort just up from Romantics Beach Villas in the General Luna area – I forget the full name of it through…just walk along the beach and you’ll find it! Thanks Bianca – I’ll get that updated! Nice aerial shot of Guyam. When we were there it was bald! Daku reef is off Daco Island? Cheers Jay! Awww gutted to hear it was empty when you were there! Yeah Daku Reef is just off of Dacu Island – you can easily get there by boat, or you could always paddle if you wanted! I would LOVE to go to the Philippines but would have to travel solo. I’m not sure if it’s a good place for solo travel? Did you meet many people who were doing this whilst you were there?